Through an educational partnership agreement between the Vernon Parish School Board and Northwestern State University, Vernon Parish Students have an opportunity to earn an associate degree of general studies if they meet all of the requirements. 10th, 11th, and 12th-grade students are eligible to participate. Students must qualify based on the admission and enrollment criteria outlined in the NSU Dual Enrollment Framework. It is recommended that students enroll in a minimum of ten credit hours per semester beginning with their sophomore year (August) and continue to enroll in at least ten credit hours per semester during their junior and senior years. Prior to enrollment in the student’s senior year, it is the student’s responsibility to initiate a review of his/her college transcript to confirm remaining requirements. 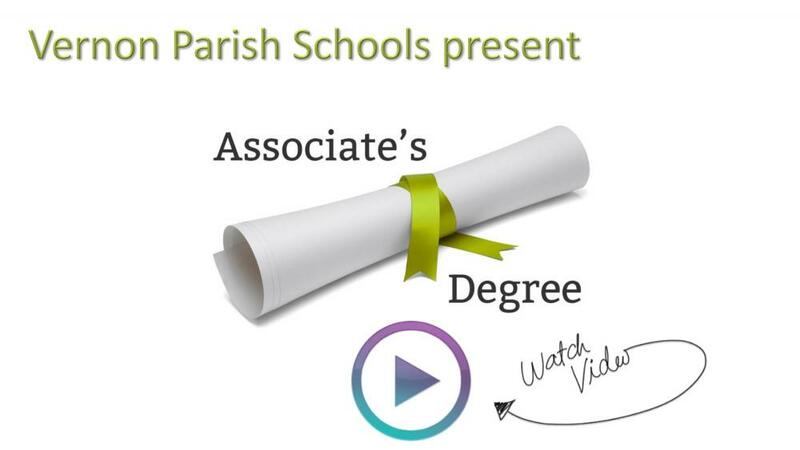 Degree conferral occurs the following August after students graduate from high school in May. Students who wish to participate in NSU’s commencement would do so in December. 1. A minimum of 60 semester hours of academic work. 2. Earn at least 25 percent of the semester hours required for the degree through instruction at NSU. 3. Earn at least a C (2.0) average in all courses used to satisfy degree requirements. 5. English 1010 and 1020 (these courses may be used in satisfying the academic group requirements). 6. Three semester hours of mathematics selected from the University Core Requirements (these courses may be used in satisfying the academic group requirements). 7. Six semester hours of natural sciences in any biological or physical science (these courses may be used in satisfying the academic group requirements). 8. Six semester hours of social/behavioral science; three of these hours must be at the sophomore level or above (these courses may be used in satisfying the academic group requirements). 9. Three semester hours of Fine Arts 1040 and three semester hours of humanities selected from the University Core Requirements (these courses may be used in satisfying the academic group requirements). 11. Thirty-two semester hours of enrichment electives selected from three of the academic groups listed below, of which, eighteen semester hours must be in a group of concentration. Course selection is subject to availability depending on delivery method. Some courses may require pre-requisite courses. Students must be enrolled in a college course for which dual credit is attempted and recorded on both student’s secondary and postsecondary academic record. District acknowledges that credit earned at the University will translate as dual credit earned at the secondary level for articulated courses.